U.S. Navy Quartermasters (QMs) are experts in navigation. They stand watch as assistants to officers of the deck and the navigator. They also serve as helmsman and perform ship control, navigation, and bridge watch duties. Also, QMs procure, correct, use, and stow navigational and oceanographic publications and oceanographic charts. They also maintain navigational instruments and keep correct navigational time, render "honors and ceremonies" in accordance with national observance and foreign customs, and send and receive visual messages. QMs also serve as petty officers in charge of tugs, self-propelled barges, and other yard and district craft. Determining compass and gyro error. Computing tide and tidal current data. Keeping logs and records to determine their ship's position by visual and electronic means. Computing times of sunrise and sunset. Following the nautical rules-of-the-road to prevent collisions at sea. 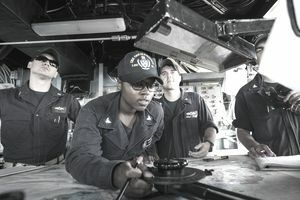 After "A" school, USN Quartermasters are assigned to all types of ships. Full-Time Support (FTS) QMs are assigned to Navy Reserve Force (NRF) ships in the Continental United States (CONUS). Upon completion of sea tours, FTS QMs will be assigned to reserve centers across the country including the heartland. While assigned to reserve centers, FTS QMs will train and administer Selected Reserve Personnel. During a 20-year period in the Navy, QMs spend about 60 percent of their time assigned to fleet units and 40 percent to shore stations. U.S. Navy Enlistees enter the Navy as E-1s (seaman recruits). They then advance to E-2 or a seaman apprentice. This advancement may be achieved after nine months of naval service, with advancement to E-3 (seaman) after another nine months. These Sailors are eligible for re-enlistment bonuses at the time of re-enlistment.